In a 2 litre casserole dish stir sugar, cocoa, milk and vanilla together until partially blended (it will be too stiff to blend thoroughly). Dot butter over top in centre of dish. Microwave on high for 2 minutes, or until smooth. If all the butter has not melted in cooking, it will as the mixture is stirred. Stir in the nuts. Pour into a lightly buttered lamington tray. Chill 1 hour in refrigerator or 20 to 30 minutes in freezer. Cut into squares. Makes about 36 squares. *Note: I use a mixture of nuts - whatever is in the pantry. 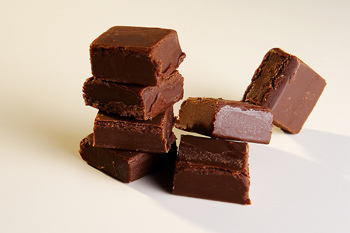 Almonds, walnuts, hazelnuts and peanuts all find their way into this fudge at some time. Use your favourite nuts or mix it up, either way it's just delicious.